The standard of compact automatic slide projectors in the economy class in an attractive silver design. Infrared auto focus system, a large setting wheel for exact focusing of the first slide and a precise lens-guide with ball-bearing offer high comfort and easy in handling. 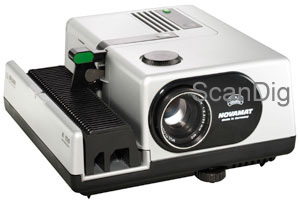 This projector is also available with infrared remote control, see our product Braun slide projector Novamat E150. Slide-lift for single slide projection. Ideal for pre-viewing and sorting of slides. With the help of the Kaiser laser pointer you can set a small laser point at your screen just pressing a button at the laser pointer. Thus you can comfortably sit on your sofa, watch your slides and indicate an important picture area using the laser pointer without standing up. In order to clean the lense of your projector we recommend the optical cleaning set from Kinetronics. This set consists of a cleaning tissue and a cleaning liquid. Thus you can carefully and effectively clean lenses and glasses. Anti-dust spray is used to clean film material - no matter if it's mounted slides or film strips - by removing dust and fluffs with a flimsy current of air without touching the film material at all. There is no better, more comfortable and more efficient way to clean your film material. Furthermore it is perfectly suitable for cleaning your projector from dust.